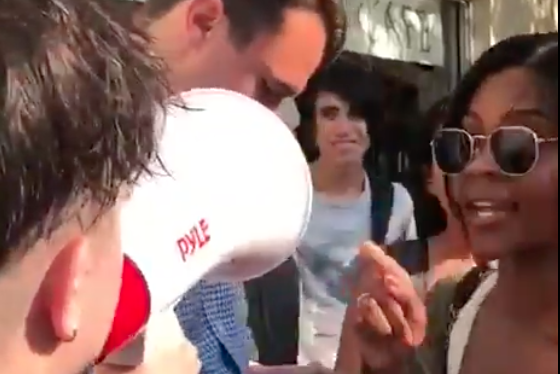 Protesters confronted conservative activists Candace Owens and Charlie Kirk of Turning Point USA at Green Eggs Cafe in Philadelphia on Monday. ANTIFA protesters confronted the founder of the pro-Trump Republican organization Turning Point USA and its communications director as they attempted to eat breakfast at a Philadelphia restaurant Monday morning. Turning Point USA's Charlie Kirk and Candace Owens – the organization's communications director and herself a conservative commentator and pro-Trump activist – were at Green Eggs Cafe, near 13th and Locust streets in the Gayborhood. When word got out where the duo was dining, protesters arrived and made themselves loudly heard. Kirk and Owens posted on social media about the incident, which include a lot of yelling and chanting and Kirk being doused with a bottle of water. In a video posted to Candace Owens' Twitter account, Philadelphia police officers can be seen attempting to separate the pair from the protesters chanting, "F*** white supremacy." "We love the police, we love America, we love the USA," Owens yells back into the crowd. After the incident,. Kirk told PhillyVoice he and Owens had been in Philadelphia to meet with Turning Point USA board members and business meetings. "We were peacefully and quietly enjoying breakfast and then they mobilized their mob against us," Kirk said. He and Owens had arrived at Green Eggs at 8 a.m., Kirk said, just as the restaurant had opened. Kirk noted that "something was thrown at me simultaneously with the water" but he was unsure as to what it was. He also said that police gave them the opportunity to press charges "but I chose not to." He had described the confrontation further on Twitter earlier in the morning, posting that "Within 20 mins ANTIFA mobilized a protest, started screaming at us, attacked us, & threatened death against us." Turning Point USA, a conservative nonprofit Kirk founded in 2012, has been mobilizing students and other young voters across more than 1,300 college campuses in the U.S. to vote for conservative candidates. Kirk and Owens have been praised and criticized for their support of President Donald Trump. A tweet sent from the account @PhillyANTIFA, called Kirk a "neo-fascist" and said Kirk visited Philadelphia "in a heat wave so some hydration enthusiasts gave him a drenching." Monday's incident follows Saturday's Black the Blue rally in support of police officers at the National Constitution Center, which attracted a conservative crowd, including activist Scott Presler, who got his tires slashed in Philadelphia while attending the rally. Today, I went to Philly, the City of Brotherly Love, to rally in support of your police.